I have to admit, working up the motivation to create a fantastic meal is a lot harder when you're cooking for one. It's been three years (this week! hooray!) since I married Vance and in that time I've always had someone with whom to share meals, help with the cleanup, and take care of leftover consumption. So today, after cooking up breakfast and lunch for myself, I couldn't bear the thought of washing another dish. That spring risotto with local snap peas and asparagus I had planned will have to wait. (I treated myself to a solo dinner at Vin Rouge instead — it's becoming a regular favorite of mine for moments of weakness when I'm in no mood to prepare dinner). In the meantime, there are a couple of easy, painless, one-dish things I've been making this week that I'd love to share. First, it's strawberry season here. Some friends from the office went strawberry picking at Waller Family Farm this week and picked the most delicious, sweet strawberries I've ever tasted. A small crowd gathered around a bowl of them Friday afternoon marveling at how good they were — and that's saying a lot considering the six candy dispensers perched nearby. Strawberry season ended a while ago back in Florida, so it's exciting to see them still growing strong here this far into spring. To celebrate, I put together a concoction I'm calling Strawberry Soda, however un-soda-like it may be. I also made baked eggs with tomato sauce a couple of times this week, using the tomato sauce from last week's Asparagus and Chèvre Crêpes with Tomato Sauce. Both of these recipes are hardly recipes at all; they're merely simple preparations of some basic ingredients. But seeing as how I was on the verge of a tantrum at the thought of washing another dish today, these will have to do! This simple concoction looks fancy, but it's really quite simple. Make it when strawberries are at the peak of sweetness (or add additional simple syrup if they're not). Place the diced strawberries in an iced tea glass (or something of similar size). Pour the lemon juice and simple syrup over the top and mash with a muddler (or the back of a wooden spoon, though that didn't work as well for me). Fill the rest of the glass with sparkling water and serve. Seriously, how easy was that? This is a great way to use up any leftover tomato sauce, though it was particularly good with last week's sauce. It's super simple — great for when you're busy preparing coffee or bacon and you just need the rest of the breakfast to sort of make itself. One more thing: this is equally delicious for lunch or dinner. I'd eat it all three meals if I could! Preheat the oven to 375°. Place a few spoonfuls of sauce into the bottom of a smallish, shallow dish, just until it's covered and you can't see the dish peeking through the sauce. 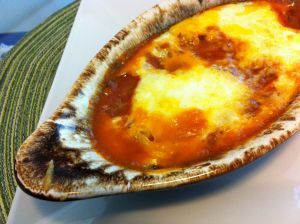 Crack the eggs, one at a time, into a small prep dish or ramekin, sliding each over the tomato sauce. Dot a few more teaspoons of sauce on top of the egg whites and sprinkle the cheese all over. Bake for 15 minutes and check for doneness. I like to turn the broiler on for an extra two minutes to get the cheese all nice and bubbly. Enjoy with some crusty bread or a savory scone.